For more information on instrument care, visit our YouTube channel. The instruction below can help you to take proper care of your instrument. Proper care is important and easy. Keep the instruments at a comfortable temperature – not too hot, not too cold. Please don’t leave them in the car where the sun can raise the temperature quickly! Humidity IS IMPORTANT. String instruments should be kept at a humidity of 40% minimum,which is hard to do in the dead of winter! We suggest storing the instrument in a room with a humidifier over the winter, or purchasing a case humidifier. Finger tapes: We recommend using 1/8” car detail tape, available at any auto store. It stays put, is easy to remove, and is thin. Thin is important! Your strings will buzz if your tapes are thick and get in the way. Please, NO SCOTCH TAPE (it can pull off the varnish) or any tape that leaves a sticky residue. Wash and dry your hands, if they are sticky. Tighten the bow just until you can imagine a pencil sliding between the hair and the wood. NO MORE. Keep fingers away from the bow hair. Oils from your hands will turn the hair black over time. A little rosin goes a long ways! Lift the violin with hands on its neck and chinrest to avoid dropping it. Loosen the bow EVERY time you stop playing. Leaving it with tension stretches the hair and can change the curve of the bow, requiring costly repairs. 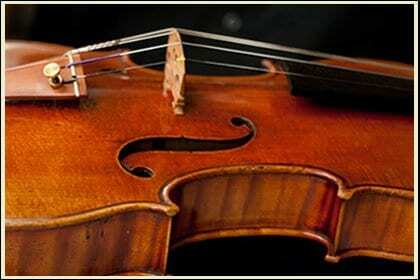 Violinists and violists, ALWAYS remove the shoulder rest when storing your instrument. Secure the bow properly in the case before closing the lid to avoid scratching the violin. Store the instrument in its case, making sure it is securely closed. Cello bags have 2 zippers for EITHER side of the endpin. DON’T zip across the endpin—the zipper will break and we will have to throw out the bag. TUNING: Caution! Tuning a stringed instrument is NOT like tuning a guitar or mandolin. The strings rest, press and pull on a bridge which is not glued down. As you tune, the bridge can move and fall down. One should be taught to tune their instrument properly. For our younger players, we suggest that a music teacher—or some other seasoned player—help tune. Many players learn to tune from the fine tuners first. From time to time, check your fine tuners to see if the levers underneath are nearly touching the instrument. If they are, have someone bring up the fine tuners to their original position and re-tune your violin from the pegs. For our older players, we suggest spending time each lesson learning to tune using the pegs. Some tips to remember: as you tune your instrument, check the bridge and make sure it remains upright with both feet flat on the top. If it is leaning forward or backward, ask your teacher adjust it or bring it into the shop and learn how to do it yourself. CLEANING: You may wipe the instrument clean with a clean piece of flannel or microfiber cloth, but AVOID furniture polish and water—even instrument cleaners are NOT recommended. CHANGING STRINGS: When changing strings, release only 1 or 2 strings at a time. Otherwise, the bridge and/or soundpost may fall over.